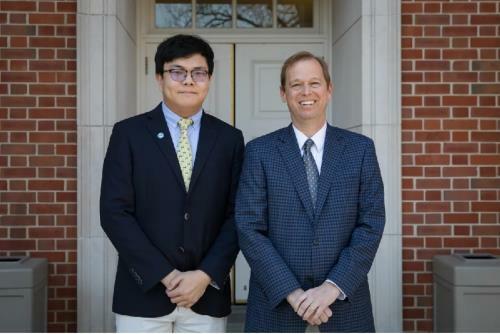 Headmaster Lee Burns ’87 presented the 2019 Walker Casey Award to senior Daniel Cui during Chapel on Wednesday. The award is named in memory of Walker Casey '47 and is one of the most prestigious honors McCallie bestows to a senior student. Voted upon by the school’s faculty and student members of Keo-Kio, the Student Council and the Senate, the award recognizes the senior who most profoundly exhibits the strong Christian beliefs and standards exemplified by Walker Casey. As a student at McCallie, Daniel has lived up to the legacy of Walker Casey. A boarding student from Dalian, China, Daniel is an active member of Keo-Kio, the Missionary Committee, the National Honor Society and is a Resident Advisor in Founders dorm. He has been active in Young Life and has taken photos at McCallie events for the school yearbook and other publications. In nominating him for the 2019 Walker Casey Award, faculty members described Daniel as an caring and compassionate young man. Another faculty member said of Daniel, “This is the guy in the dorm that I know will help others stay on task and do the right thing. He sees problems and fixes them before they have time to develop into a full-blown disaster. I have know of few boarding students — and no other foreign student — who has been involved in as many things and who has worked in the Chattanooga community as much as he has. Walker Casey died from a brain tumor in 1947, six weeks before his scheduled graduation date at McCallie. He was inducted into Keo-Kio, the senior leadership organization, before his passing. The award, established by his parents and the school, is presented each year around Walker Casey’s birthday.